As an international hiking destination, South Korea has been a bit overlooked. This is mainly due to the lack of English information available to foreign hikers and climbers, but also a product of Korea's underdeveloped foreign tourist industry. Most of the national parks in Korea have simple English maps or brochures, but the practical information is limited and takes a backseat to the nation's rather tiresome habit of boasting and exaggerating about everything it has to offer. This turns a lot of Westerners off, which is unfortunate, because Korea does have much to offer the motivated hiker. It's an extremely rugged country overall, with small to medium-sized mountains covering 75% of the nation's land area. Though small in area, the Korean national parks are diverse and beautiful. 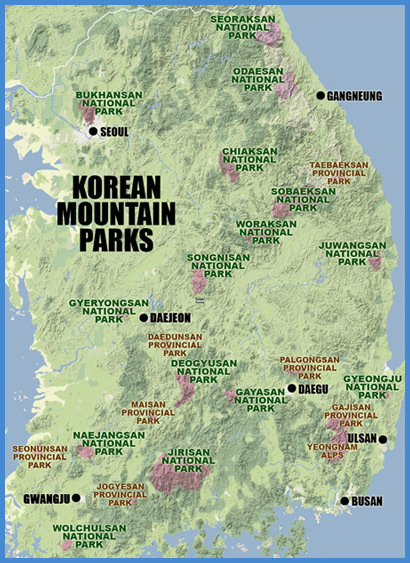 There are a total of 20 national parks in Korea (including 16 mountain parks), making up an impressive 3.7% of Korea's total land area. The mountain parks are scattered throughout the peninsula, with Seoraksan the farthest north and Wolchulsan the farthest south. Mountain ranges are often the basis of provincial boundaries, and consequently 7 of the 16 parks lie on the borderlines of the provinces and can be accessed from multiple directions. Jirisan, the largest and oldest of the national parks, is found at the nexus of three provinces--South Gyeongsang, South Jeolla, and North Jeolla--and offers the most serious hiking in the country. Every park is unique, ranging from smooth, rolling hills and valleys to ragged, craggy ridges and sheer, rocky cliffs. Most the parks offer a wide variety of easy to moderate day hikes and a few longer, more strenuous routes. The longest and most strenuous route in Korea crosses the entire Jirisan range and takes about 3 days (we did it in 2 days, but it was pretty brutal). Camping facilities, though fairly undeveloped, are available at some parks, but most are only open during the peak summer season. Some of the large parks, such as Jirisan and Seoraksan, have mountain shelters where long-distance trekkers can crash. None of the parks in Korea allow backcountry camping, which is probably wise considering the number of local visitors these parks get. To further protect the natural geography, the Korean National Park Service (KNPS) temporarily closes trails on a rotating basis to allow wildlife to recover. As an American who has hiked extensively in Korea's national parks, I'm continually surprised by the number of foreign residents I meet who have never explored the park system. And yet, it's understandable, considering the lack of easily accessible, accurate, English language information. Before setting off into the hills, most people want to know what they're getting into, how to get there, how long it will take, how much it will cost, and where to stay. Random exploration is great if you have unlimited time and resources, but not if you only have 48 precious hours of weekend freedom before you start work again on Monday morning. The purpose of this site is to provide people with the information they need to enjoy Korea's mountains fully. During the two years I lived in Korea, I gathered as much information as I could about hiking in the parks, and much of it is posted here. Now that I'm no longer living in Korea, I'm opening the site up to the rest of the hiking community. What we need here are detailed summaries of the different hiking and mountaineering options in Korea, along with detailed trail maps, transportation info linking the parks with major urban centers, photos, etc. You can help KOREA IN THE CLOUDS by saving all the maps and pamphlets you get when you visit the parks and by taking note of trail closures you encounter, changes in fees, the operating capacity of mountain shelters, and anything else that would be of interest to hikers. Then pass that on to me at alexzuccarelli@gmail.com so it can be added to the blog. Of great worth are verified hiking distances from point to point, as these are not shown on currently available maps (except those I've created). I made it to all of Korea's National Parks, and many of the Provincial Parks which are just as amazing! I agree, though with a little work I've been able to track down all the info I've needed (and collect those Dong-ah bandanas with the "maps"!). I was also given a coffee table book on the parks (in English), that is stateside now-- never saw another one, but it's worth tracking down! Anyway, I look forwards to more of your maps and adventures! Maybe we'll cross paths!